The former Northern Pacific Railway depot in Nisswa now serves as a historical museum. The railroad right-of-way is now the Paul Bunyan State Trail. Smiley Township was founded in 1900, but local resident Leon Lum convinced residents to rename it Nisswa, from the Ojibwe word "nessawae" (which means "in the middle" or "three")[source? https://ojibwe.lib.umn.edu/word-part/nisw-initial provides different options], when the town was incorporated as a village in 1908. 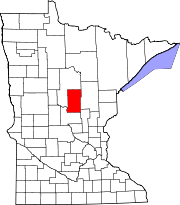 Nisswa became a municipality on December 4, 1946. According to the United States Census Bureau, the city has a total area of 18.34 square miles (47.50 km2), of which 10.78 square miles (27.92 km2) is land and 7.56 square miles (19.58 km2) is water. Surrounded by lakes, Nisswa is part of the Brainerd Lakes Area. Minnesota Highway 371 serves as a main route in the city. Other routes include County Roads 13, 18, 77, and 115. As of the census of 2000, there were 1,953 people, 819 households, and 577 families residing in the city. The population density was 179.5 people per square mile (69.3/km²). There were 1,532 housing units at an average density of 140.8 per square mile (54.4/km²). The racial makeup of the city was 98.87% White, 0.26% African American, 0.10% Native American, 0.15% Asian, 0.10% Pacific Islander, 0.10% from other races, and 0.41% from two or more races. Hispanic or Latino of any race were 0.41% of the population. There were 819 households out of which 25.5% had children under the age of 18 living with them, 63.0% were married couples living together, 4.3% had a female householder with no husband present, and 29.5% were non-families. 24.3% of all households were made up of individuals and 10.9% had someone living alone who was 65 years of age or older. The average household size was 2.37 and the average family size was 2.81. In the city, the population was spread out with 22.2% under the age of 18, 4.7% from 18 to 24, 25.9% from 25 to 44, 29.4% from 45 to 64, and 17.8% who were 65 years of age or older. The median age was 43 years. For every 100 females, there were 102.8 males. For every 100 females age 18 and over, there were 100.3 males. The median income for a household in the city was $48,306, and the median income for a family was $54,931. Males had a median income of $37,772 versus $29,412 for females. The per capita income for the city was $26,265. About 2.7% of families and 4.9% of the population were below the poverty line, including 6.5% of those under age 18 and 5.8% of those age 65 or over. ^ United States Census Bureau. "Census of Population and Housing". Archived from the original on May 12, 2015. Retrieved July 14, 2014. ^ "Population Estimates". United States Census Bureau. Retrieved 2014-07-14. † indicates a county seat. ‡ indicates that it is partially in the micropolitan area. § indicates a CDP. This page was last edited on 6 April 2019, at 19:16 (UTC).